In 1961 Barbie had juicy red lips with matching red nail and toe polish. She came with a ponytail hair style or the “new” updated teased layered circle cut, which is referred to as the Bubble cut. 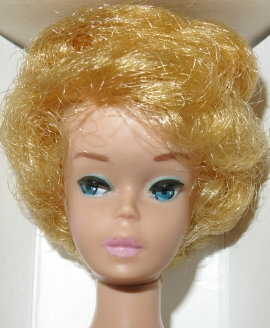 The Bubblecut Barbie (or ‘Bubble Cut’ as the box says) had blonde, brunette (raven), titian (red), or the extremely rare brownette (light brown) hair colors. One other variation in 1961 was the hard to distinguish White Ginger Bubblecut. The White Gingers (stock #850) have a short tight bubble and used the thinner face mold as did all the other Bubbles from 1961. They came on the hollow Barbie only body which included the small neck knob, with the marking ‘Barbie ® Pats’ Pend.©MCMLVIII by Mattel Inc.’. Their eyes were a deep turquoise color with green eyeliner, and had pretty pink bubblegum lips (some of which have turned white over the years). Her lipstick didn’t match her nails and toes, as the White Gingers retained the red nail and toe polish like her counterparts. These initial dolls were made out of vinyl that got sticky over time. Therefore some have that “greasy face” syndrome. Only the Gingers have the very light blonde hair color (like platinum), which over time usually have oxidized to a darker golden blonde. The dolls with hair that is still the pretty light blonde color are much harder to acquire and are more valuable on the secondary market. The White Ginger came in a Gay Parisienne Barbie ® box marked “White Ginger” on the end flap. The box contained a box liner, white sunglasses with blue lenses, white pearl earrings, black open toe heels, black wire stand, and a pink booklet with a picture of Barbie and Ken on the front. It wasn’t until 1963 when Mattel introduced the official Platinum Blonde Bubblecut. Keep in mind the Platinum’s are on the slightly taller Barbie/Midge marked body with a larger neck knob. They have a poofier bubble, fuller face, and various colors of nail and toe polish. Some of these light haired platinum’s have oxidized to a golden blonde over the years as well. Now here are a few more specifics to throw some confusion into the mix. Mattel was famous for mixing things up. There are White Gingers out there that have blue eyes and blue liner rather than the standard deep turquoise eyes with green liner. Also, there are 1962 Bubbles with Platinum hair on Barbie only bodies. These dolls came with a red swim suit. Mattel used up old body parts they had around from prior years to unintentionally keep us collectors always guessing! A greasy face White Ginger who has oxidized hair and lips that have turned white.